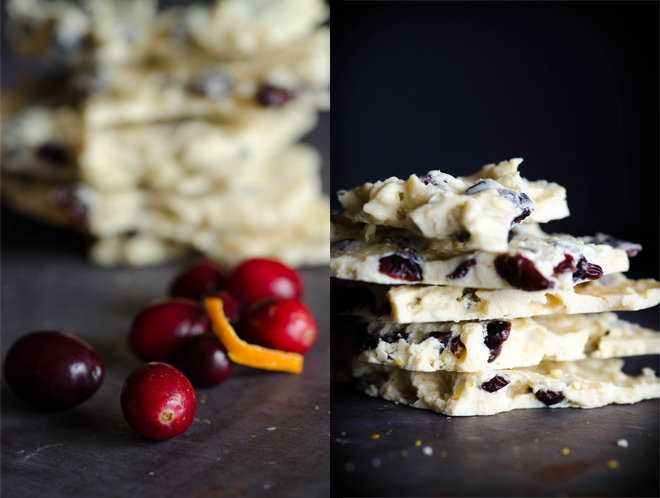 White Chocolate Cranberry Bark, sweetened with honey and spiked with vanilla bean and orange zest, will fill the little holiday boxes we give to neighbors and friends this time of year. They’ll sit there, nestled in dotted crimson tissue paper, right next to the date-sweetened gingerbread men, mandarin oranges and the sesame honey candy. That is, they will if a certain tow-headed little boy I love doesn’t get to them first. You see, we favor a five-handed holiday; that is: handmade, hand-me-down, secondhand, helping hands and hand-in-hand. The frantic nature of the holidays never appealed to me (which is, of course, not to say I don’t enjoy a good holiday sale). Instead, I prefer to take the time and sit down with my little boy to work on projects hand-in-hand. We bake. We snowshoe. We snip away at squares of paper to make snowflakes. This year we’re painting our own wooden Advent Calendar which I’ll fill with little homemade treats and special hand-crafted items we bought at the recent holiday bazaar. I plan to tuck a few pieces of this Honey-sweetened White Chocolate Cranberry Bark into the calendar’s little boxes. Cocoa butter is the primary ingredient in white chocolate and it is produced when cocoa beans are fermented, roasted, and pressed. This process separates the chocolate liquor from cocoa solids and cocoa butter. Cocoa butter is often then refined and deodorized which removes its beautiful, rich and bloomy floral notes which is why it’s imperative to buy food-grade, unrefined oil (you can get it online or in a few of the better health food stores). Cocoa butter is often used in natural skin care products – and you can find quite a few recipes for its use in the book Organic Beauty which provides tons of recipes for homemade creams, lotions, scrubs, tooth powders and other DIY cosmetics. I recommend you buy food-grade, unrefined cocoa butter for both culinary and cosmetic applications as you’d never want to put something on your skin that you wouldn’t put in your mouth. Cocoa butter is rich in vitamin E and K – fat-soluble vitamins that help to support eye, skin and heart health. Saturated and monounsaturated fat comprise the 97% of fatty acids found in cocoa butter, and these fats also contribute to cocoa butter’s stability in cooking and its long shelf-life. Monounsaturated fat, the same kind found in olive oil and avocado and lard, supports cardiovascular health while stearic acid (the primary saturated fat in cocoa butter as well as in beef) has cholesterol-lowering properties. While cocoa butter, with its floral notes and rich creaminess, is the primary ingredient in white chocolate, I still prefer making my own. Commercial white chocolates are typically loaded with emulsifiers, additives and white sugar. And they are, to my taste, far too sweet. I prefer a simply making my own white chocolate – with honey and vanilla – similarly to this recipe for honey-sweetened white chocolate chips though I prefer to use far less sweetener. Cocoa butter is not widely available, which is why I use it only occasionally – for holiday treats where its use as a special occasion ingredient can be best magnified. Occasionally, if you look hard enough, you might find unrefined, food-grade cocoa butter available at large health food stores. I typically purchase mine in bulk online (see sources). Faintly sweet, this simple white chocolate cranberry bark relies on preparing homemade white chocolate using honey, cocoa butter and vanilla bean powder. You can find cocoa butter and vanilla bean powder online here. Melt cocoa butter in a double boiler over gently simmering water. When the cocoa butter melts into a viscous, fragrant and slightly yellow oil, remove it from the heat and allow it to cool on the kitchen counter for 20 minutes. Pour the melted cocoa butter into a food processor and pour in honey. 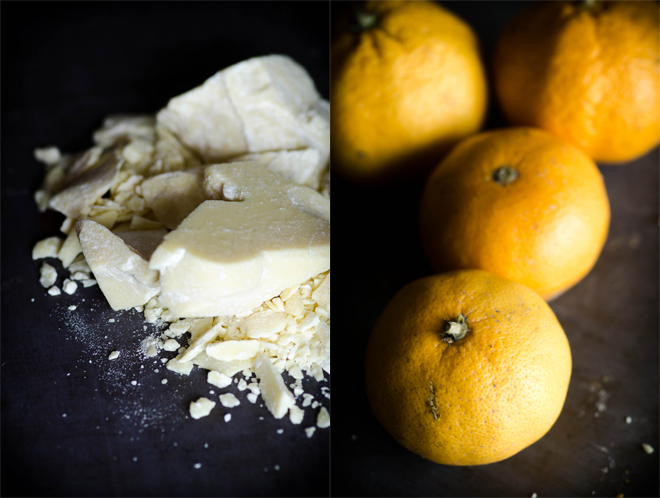 Pulse three or four times, then add vanilla bean powder and orange zest to the sweetened fat. Process until well-emulsified, then transfer the cocoa butter (still in the food processor bowl with the blad attached) to the refrigerator and let it cool a further 20 minutes. Remove the food processor bowl from the fridge and reattach it to the base. Process the sweetened cocoa butter a minute or two until its color becomes opaque and its texture creamy. Pour the cocoa butter into a mixing bowl and fold in cranberries. Spread the cocoa butter and cranberries onto a parchment paper-lined baking sheet and refrigerate until hard. Break into hunks and serve. Sounds delicious! I would so love to try some. I am sure it tastes awesome. This looks wonderful! What a treat. I love your way of looking and thinking about the Christmas season. We are doing handmade gifts this year, but mostly crochet, not food. However, I think everyone will appreciate some of this at the family gathering. This looks unique and wonderful. A few questions: how much vanilla extract should I use to sub for the vanilla bean powder? Can I use a hand mixer instead of a food processor? If I make these two changes will it still turn out just like yours? Thanks in advance for your reply! I don’t really know – you could experiment and get back to us? You use twice the amount of vanilla extract as you would powder, generally, as a substitute. where can we find the link for your five-handed holiday. I tried and it won’t let in. So intriguing . . . really want to know more. It looks like she put her blog on invite-only. I’ll remove the link. I am on a cranberry spree right now, so I am going to go find some cocoa butter and make this!! It looks just gorgeous, as always! What a great recipe! One question Jenny, does this recipe stay “set” for gift giving? Or does it need to be eaten, soon after taken from the fridge. Yes! I’m glad you asked that, Molly. The bark does set for gift-giving. Since cocoa butter is SO saturated, it takes a lot of warmth to melt it. Will definitely be making these this week – looks great! I will probably use fresh pomegranate seeds instead of the dried cranberries . I’m loving vanilla powder as well – I just used it instead of vanilla extract in my nut flour pancakes this past weekend and we all could taste the difference. I’d be careful with fresh pomegranate seeds – the water content may cause the cocoa butter to seize and become grainy. But, vanilla powder is awesome stuff. My favorite sweet spice. Easily. This looks incredible. I’ve never baked with cocoa butter or vanilla powder. No time like the present to start! Thank you so much for including “where to buy cocoa butter”. I looked at your resources page for a place to buy cocoa butter. I went to every site that was under oils and did not find cocoa butter. Specifically, where did you buy this in bulk online? I found mine at Mountain Rose Herbs. I beleive they sell in bulk as well as in smaller containers. I just rec’d some cocoa butter that I ordered to make a skin cream with, but it smells so good I want to eat it! So maybe I’ll use half for the cream and half for this!! I have the same problem- I followed your links and still do not see where you purchased the cocoa butter. Please advise! If I can make this candy for my kids (who both have severe food allergies and are on a modified GAPS/Paleo/SCD diet), it will SAVE Christmas! It’s listed under Wilderness Family Naturals: unrefined cocoa butter. I made this and the cocoa butter turned out sort of frothy and softer instead of a nice opaque crunchy bark. I am going to retry it, but was wondering what I did wrong? Also, it didn’t taste as sweet as I would like it to. Can I add more honey or sugar? Thanks in advance for any help and Merry Christmas! Oh wow! I love this! I bought cocoa butter from Mountain Rose Herbs, I got it for soap or some vegan crunchy energy ball snack or something? Chocolate bark is a much better idea! I even have some oils I could use. I bet mint would be fierce. Thanks for such a wonderful recipe. I was beginning to think I would end up making lotion balls. I never thought of making white chocolate from scratch! What a great idea though! I always love making things from scratch whenever possible. When I took the coconut butter/zest/vanilla bean mixture from the fridge after 20 min (still in the food processor bowl) and started to blend it for the 1-2 minutes suggested, after about 1 minute of blending it completely broke. The oil separated from everything else and I couldn’t emulsify it again! Hi Shonna, did you ever figure out the problem? I also have had problems with the oil separating from the honey and would love to get it right this time around. Here’s a tip for newbies, having made this a couple times now myself: take the lid off the food processor before you put it in the fridge. The cocoa butter glued my lid solidly to the bottom, even tho’ I’d tried to scrape it clean with a spatula. Had to melt it again & start all over. The second time I made it I did the same thing (duh), tried to start over, & then couldn’t get the mixture to emulsify again, like Shonna above. Still edible, more like a gum than a stiff candy tho’. I don’t think I will ever forget to take off the lid again! Hi, I made this last year and couldn’t get the honey and the cacao butter to blend — they stayed separate. I’m now trying again this year (with peppermint instead of the cran/orange) and would be really grateful for the guidance. It seems the longer I blend in my Vitamix the more it separates itself. Should I be using a food processor instead? Thanks and happy holidays!! Do you dehydrate your own cranberries from fresh bought at the store? Tried this for the first time today and it’s divine. Subtle and delicious. Thank you for sharing.